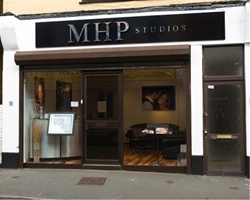 MHP Studios has been established for over fifteen years. Mark Hughes, owner and manager of MHP Studios has earned a reputation throughout the South East of England for producing high quality, stylish, and creative photography. Mark and his dedicated team are here to help you create the images that you have always wanted from the initial consultation, right through to the time you collect your finished images. Our modern studio is conveniently located in Caterham on the Hill Surrey, offering easy access and convenient parking. It has been designed to create a comfortable and relaxed atmosphere where you can discuss and create all your photographic requirements. Normal Opening Hours: Monday - Friday: 9.30am - 5.30pm <> Saturday: 10.00am - 2:00pm . Evenings and other times by appointment only.